My order history with Lost Art Press says that I placed an order for one hardbound copy of The Anarchist’s Tool Chest on March 12, 2015. It arrived just a few short days later and was devoured just a few short days after that. (Metaphorically, of course. I don’t eat books. My apologies if you suffer from xylophagia.) In some ways it seems almost impossible that a year has passed and in others it seems like a dozen have passed in its stead. 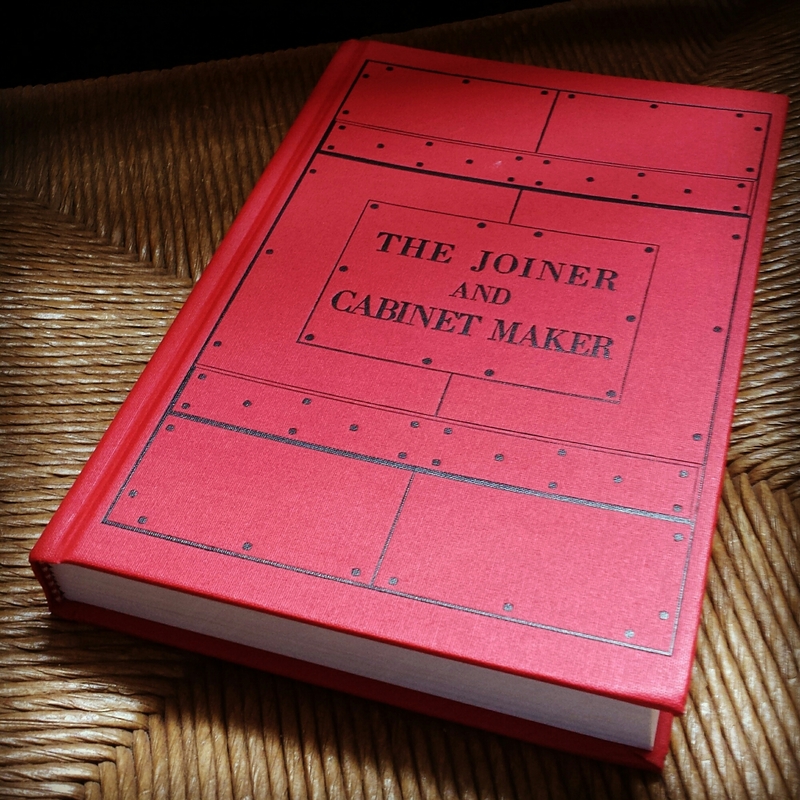 It has been a journey for sure, and aside from discovering and devouring the ATC, no book has been more interesting and compelling to me in the past twelve months than the Lost Art Press edition of The Joiner and Cabinet Maker. As soon as I finished the original text my head was swimming with plans to build the projects contained therein, yet I restrained myself from building alongside young Thomas partly because I had other projects in progress and partly because my workshop was in disarray. It just never seemed like the right time to clear the decks and begin my virtual 19th century apprenticeship. But now, having finished my bench and settled into my space a little more comfortably, I have decided to begin my journey. I picked up the book again last week and started reading through the second half in which Chris Schwarz takes his own journey into the world of TJAC, and offers build notes on all three projects. First off I want to confess to being a bad apprentice. Despite all of Chris’ well written arguments not to skip the packing box, I decided to skip the packing box. For now, at least. I made the decision not because I thought it was beneath me, useless or too simple, but because I didn’t have the nails on hand to do the construction and I didn’t want to re-saw all of my 3/4″ “deal” down to 1/2″ to complete the project. That seemed counter to the spirit of the thing. I have a whole variety of cut nails on order from Brooklyn Tool and Craft at the moment, so all is not lost. I may just have to build it from 3/4″ stock. I did search my stock pile for good clear pine and found just enough to complete the School Box project, so I set to work directly on that. 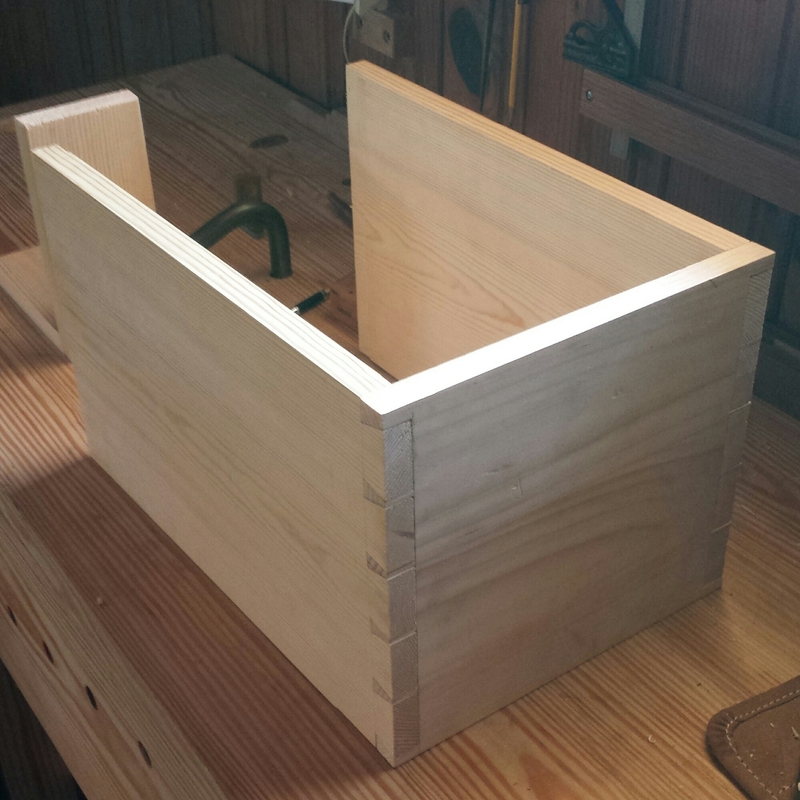 I broke the stock down into rough lengths (leaving 1/8 – 1/4″) and glued up a few panels. My 12 ppi cross-cut Disston D-23 excels at this kind of work making it possible for me to work much closer to my final dimensions with less waste. Because Chris goes into some detail about glues in his introduction to the projects, I decided to try liquid hide glue on some of the panels and Titebond on others just for comparison. I found that when it comes to the finished panel, you cant tell any difference. If the joint is good dry, either glue works acceptably. I flattened the panels by traversing them with my jack plane until flat and then going with the grain to get a nice smooth working finish. I’ll save the fussy smoothing until later. I do have to say, however, that I was taken aback by just how good my new Lie-Nielsen no.5 performed here. 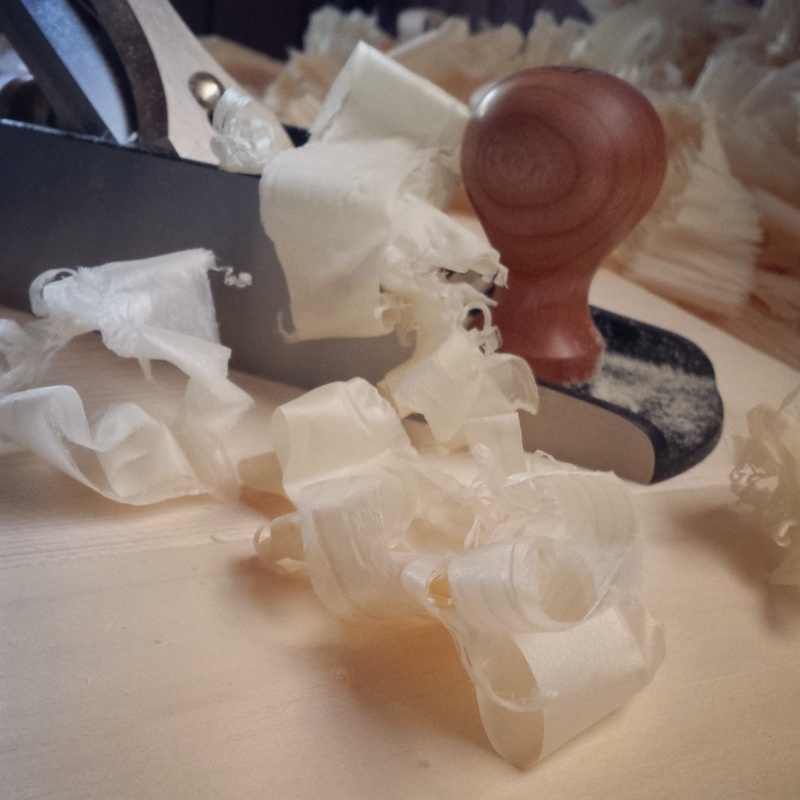 It shifted from rough work to silky smooth with just a twist of the depth adjuster. All told, that work took me a few hours one morning but it left me with a nice stack of panels ready for the shooting board. I used my cutting gauge to mark the ends of the boards for dovetailing and tried the “rabbet trick” for these tails, making sure to kerf the far end just a little to avoid spelching and blow-out. 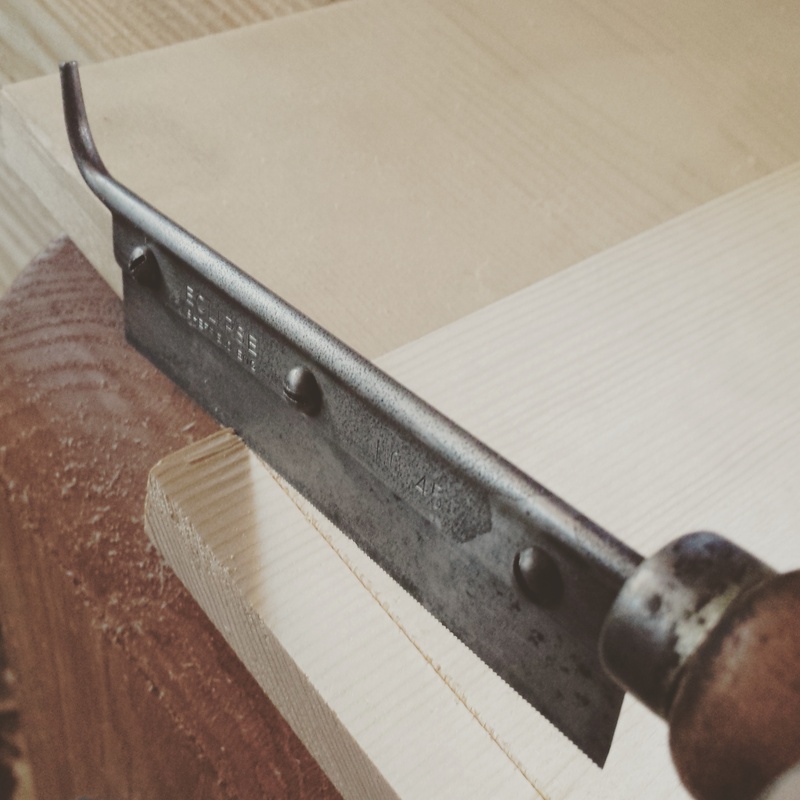 I also decided to set my own habits aside and try cutting these dovetails “pins first” as young Thomas does in the book. After cutting and clearing the pin boards I took one of Chris’ suggestions in the notes and made a 90 degree jig to hold everything in place while marking the tails. 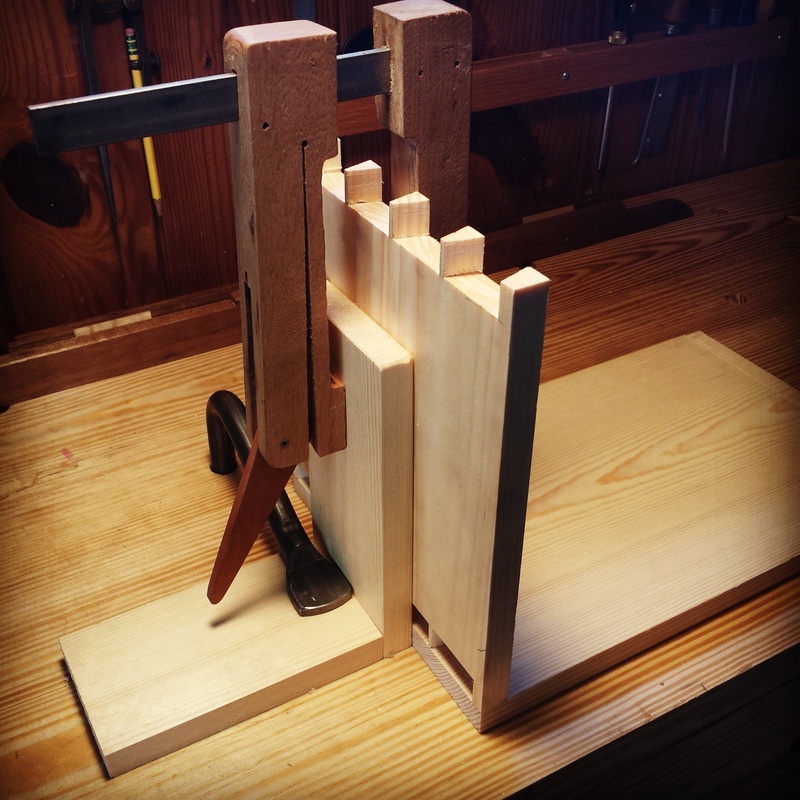 It was actually a great help and, were I inclined to cut dovetails pins first from now on, I would certainly use this jig again. Thing is, I’m not really inclined to cut dovetails pins first again. They went together, but they were more fussy than I’m used to when cutting tails first. I think that if I were to really dedicate myself to cutting a lot of joints this way I would eventually put in enough hours that it felt natural, but for some reason I find it easier to get my tails square more readily than the pins. 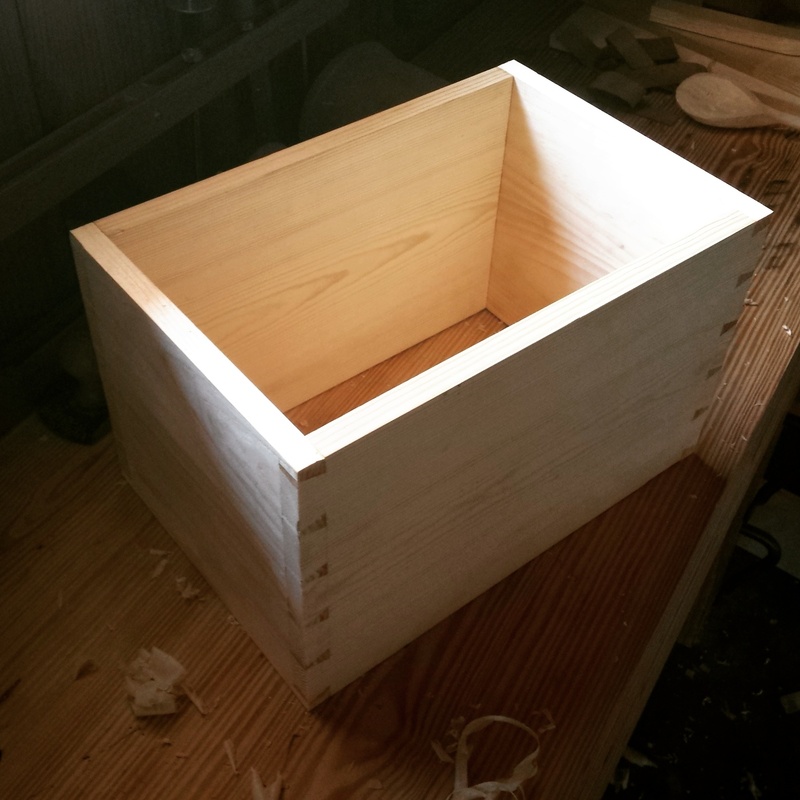 I couldn’t trust my eyes and I kept checking with my dovetail square, but I was never quite happy. I assure you, it was not the tools, it was the operator. In the end, it went together (with hide glue and clamps) and it’s a good solid box. Thomas is off in the corner laughing a little under his breath at my work, but when I cover this thing with milk paint only I will know my sins. 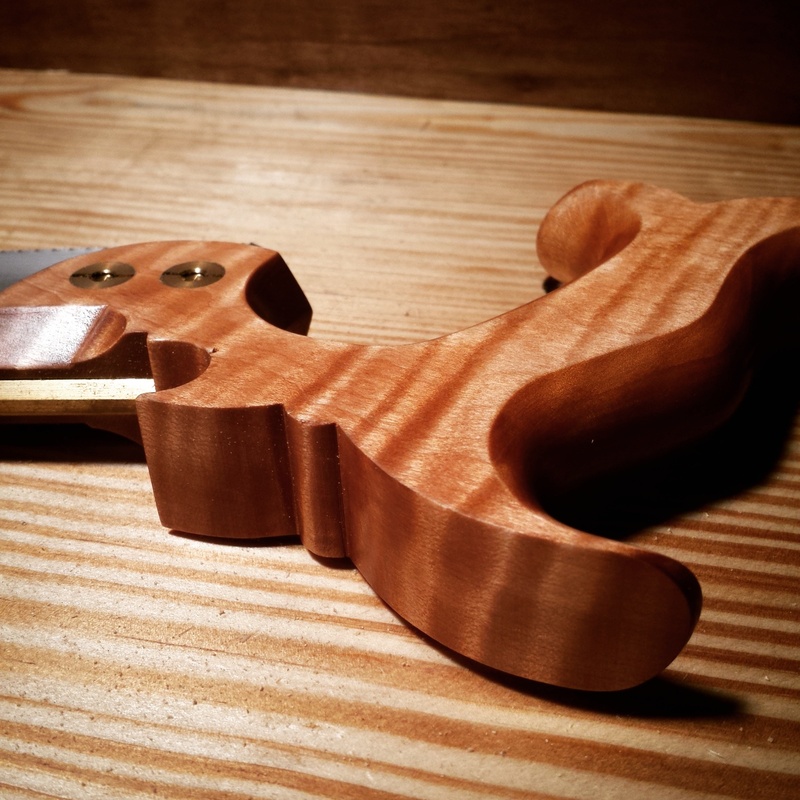 I like that luthier clamp you used with the 90deg jig. Do you make that or was it purchased? 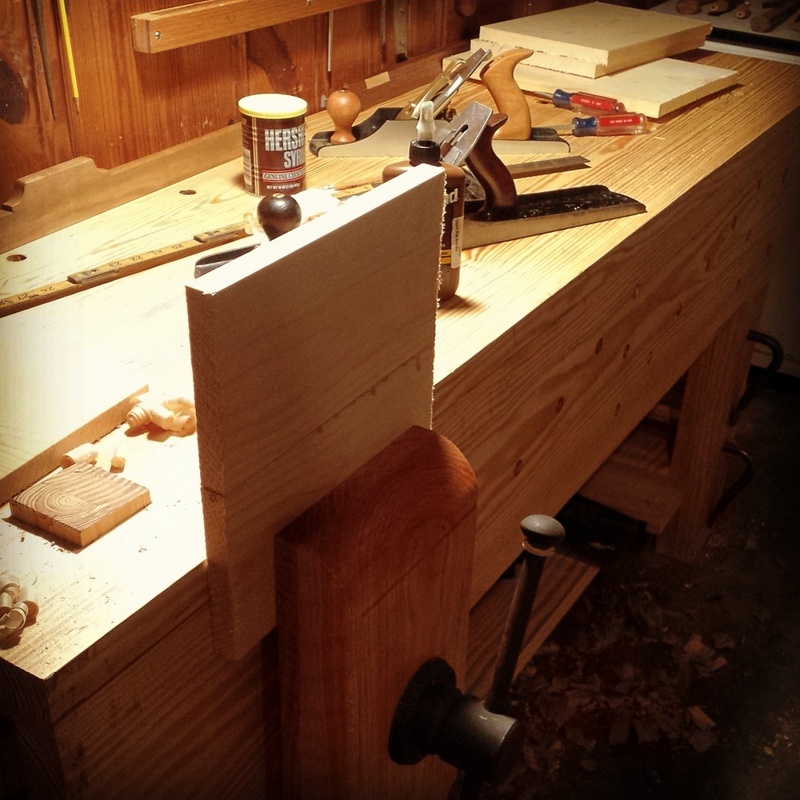 Those are shop made cam clamps that I made out of some white oak I had laying around the cam is cherry. I made four about a year ago and I keep telling myself I need to make more. 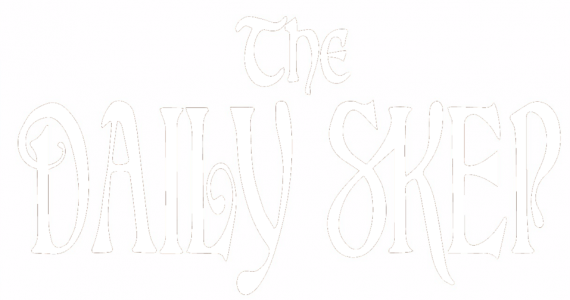 Do you have a post about them? No, but you can find plans for them on the internet. They’re reasonably easy to make. Jim, it’s nice to see your progress on the school box. Like you I’ve had these projects on the list for quite some time. This may be the inspiration I need to bump them up. 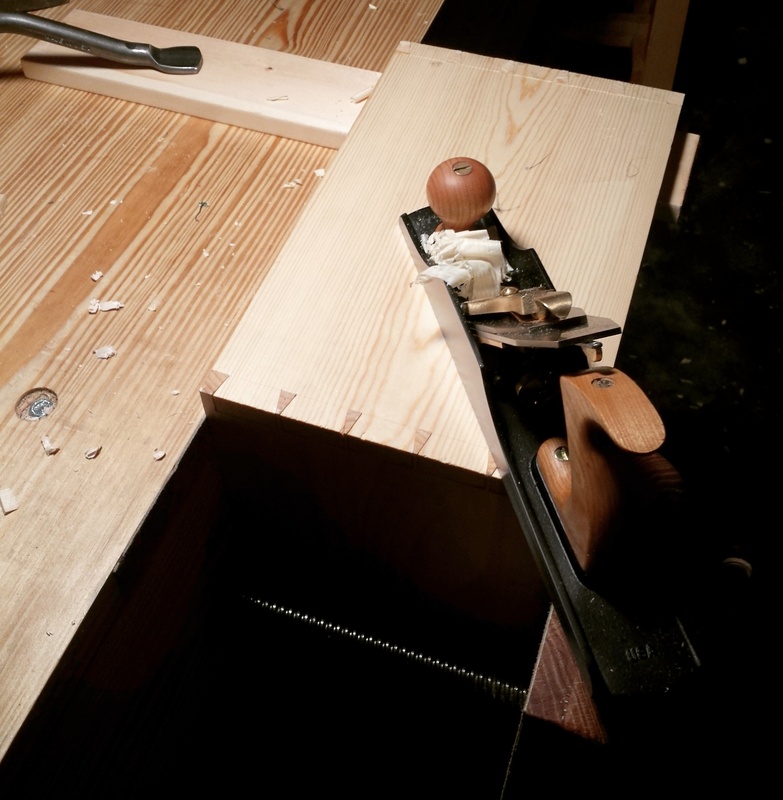 But I do really need to make some saw benches, so they still might take priority… Looking forward to more. Yes, make those sawbenches. It realy just takes a long afternoon. I use mine so much I’m considering making another set. 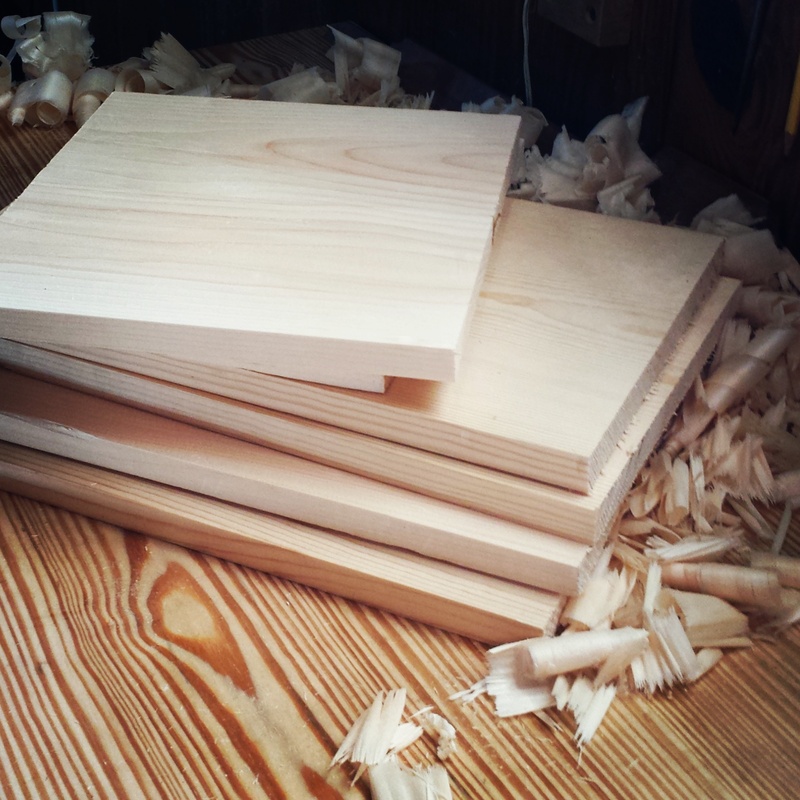 I’m going to try my hand at staked furniture and attempt the ones from the Anarchist’s Design Book. Hey James, can you tell me anything more about that Eclipse saw you posted up above? I have a similar one I inherited from my grandpa that I’d like to use, but I’m not sure I can get a replacement blade or if it would be possible to just resharpen (a couple of the teeth are pretty far gone). Eli, I wish I could. I found mine at a flea market and cleaned it up by taking out the plate and soaking the metal parts in vinegar overnight, a little time with the wire brush and scotchbrite pad and then I oiled them down. I’ve tried looking for more information about them, but very little is available. I have never been able to find a replacement blade. How bad is the blade on yours? I ask because it seems very hard to resharpen (without a magnifying glass and needle files) but soaking it in citric acid or the like might give it some life. If the teeth are too far gone, as you mention, you might need to look for a blade (not xacto) about 5″ long and drill it to match the frame. Thanks James, I’ll give that first suggestion a go and see how it turns out. I’ll get back to you on the blade itself once I can look it over better.